Hansell Notes in a Minor Key: Name the Bear! Ok, here is our newest addition. He needs a Tillamooky name. 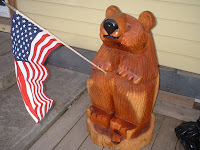 He was created on the Wilson River and he doesn't need to hold a flag all the time. He just has one because I wanted him to hold one. Anyway, help us name him. S and I would like to call him Wilson, but J doesn't like the name. He says it is a brand name for volleyballs. On another note, Happy almost Easter! My sis, on her blog about the Diverse Work in Progress, has a great recipe using hollow chocolate bunnies, miniture cadbury eggs, and peeps. It is called an Easter turducken (check it out, if you haven't already. You have to look for it in one of her later March blogs.) S and I are co teaching Sunday school tomorrow and I made 'Easter cookies' or 'resurrection cookies'. It took me until I started to mix them until I realised what they were! My sis made them for 4-H years ago, but they were called 'Forgotten cookies'. Someone adapted the recipe and added scripture to it. We are also making nail crosses from some old square nails that S found in an attic of somewhere around here. (Note, the old stuff blog? It is EVERYWHERE.) We'll hang them on red ribbon. After all that work, I just hope we have more kids than 2! One very exciting note, I got to see Enchanted finally. I Loved It! Book of the day (one I got for me for Easter!) by Mercedes Lackey, the Fairy Godmother (again!). How about Liberty, Lion, Shilo, Latimer, Avenger,Garibaldi, Kiwanda, Hebo. OK I rummaged around a Tillamook map on Google Earth. I was looking for anything that might sound like a good bearish name. 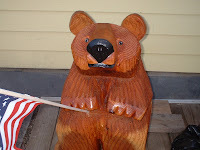 I like "Stillwell" sounds sort a bearish, it is a street in Tillamook and he is sitting still. That's my one and only idea. Okay, this is a rough one. Okay okay so I'm not so good with the names.